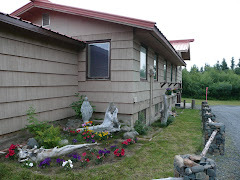 Friday, July 23, the editor of the Catholic Anchor arrived in Dillingham, Alaska. Joel Davidson came to Dillingham with hopes of getting some Alaskan Bush stories he could take back to Anchorage with him. His trip was bitter sweet. His trip was bitter because poor visibility and low ceilings kept our Cherokee Warrior II out of the air. 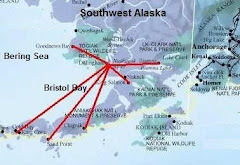 We had planned to fly to Clarks Point, Levelock, and King Salmon for Mass. 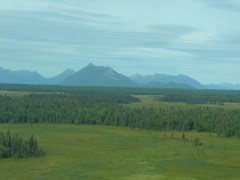 Additionally we were going to fly to Koliganek to visit some parishioners and then fly over to Kelly Mountain, where James Kelly died on the mountain top! The visibility and ceiling were terrible the entire time Joel was here. Needless to say, we were grounded. Below, Clarks Point, which is only 12 miles away, could not be seen through the fog. His trip was sweet because Joel was able to do some interviews with local families. One of his interviews was with the Reynolds family where he interviewed them about homeschooling. Part of being stranded in weather in Dillingham for three days mean one gets a tour. 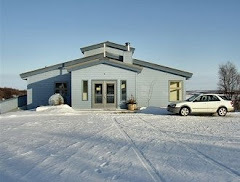 Joel received a great tour of Dillingham: the hospital, Aleknagik Lake, the harbor, and town. We ate at the Twin Dragon Friday evening and I made Tacos on Saturday. 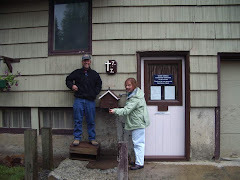 After arriving in Dillingham, Alaska, Joel Davidson poses for a picture in the Holy Rosary Rectory. He is standing by a picture of Martin Luther and Geronimo, which my grandmother painted. After an interview with the Reynolds family about home schooling, Joel chats with Mark. Below Joel Davidson takes a picture of the Reynolds family. (back from left to right) Mark, Hugh, Joan, Anthony and dog. Walter is in the front row. Both Anthony and Walter are altar servers at Holy Rosary. Joan home schools all three boys. Our statue of Mary inside Holy Rosary was re-painted in 2006. 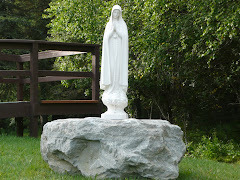 Our Statue of Holy Rosary of Fatima arrived in 2007 from Rome. The Catholic Anchor wrote a story about the statue. Here the editor of the Catholic Anchor, Joel Davidson, stands on the steps of Holy Rosary. Joel took a few pictures of the cemetery at Holy Roary. 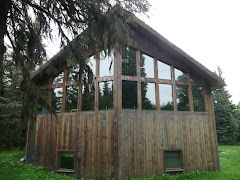 Two weeks ago, a youth group from Anchorage visited Holy Rosary Mission in Dillingham, Alaska. The youth re-planted the lawn at the Dillingham Public Library. Below, Joel Davidson checks out the progress of the grass. Fishermen at the Dillingham boat harbor were gearing up for another opening. The Golda June, a fishing boat owned by parishioners Jim and June Ingram, is prepared for another fishing adventure. 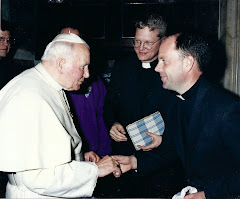 Jim and his daughter Golda were confirmed into the Catholic Church by Archbiship Schwietz last month. Here, I pose by the Golda June. 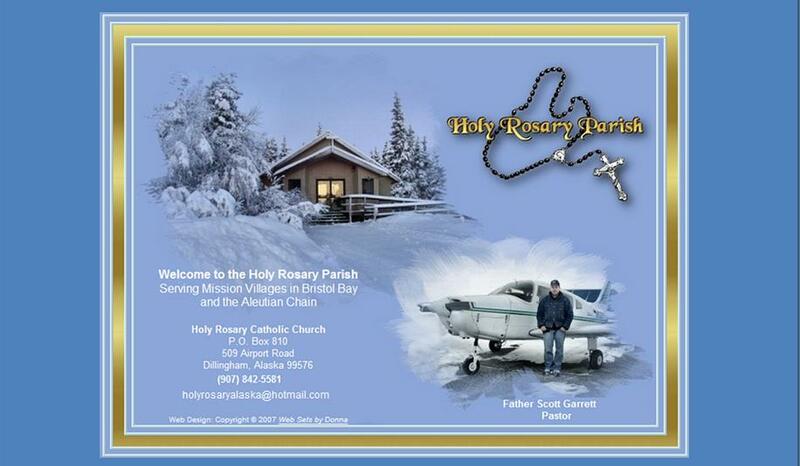 After a nice potluck after Mass on Sunday at Holy Rosary, we sent Joel back to Anchorage on the 7:15 PM Penair Flight. We hope to see you back very soon Joel! As always, when the weather permitts, fly safe out there! 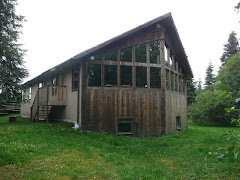 The second annual electronic free community service youth retreat kicked off July 5, 2010. At Holy Rosary Mission in Dillingham, Alaska we were blessed with 13 youth from Saint Benedicts and Saint Elizabeth Anne Seaton in Anchorage. The youth were accompanied by three Adults, Deacon Dez and his wife Cindy (youth ministry from SEAS) played music, cooked, and organized, and Bob McMorrow (youth minister from Saint Benedict) kept us all in line. Some highlights of the youth retreat include tearing up and re-planting the Dillingham Library lawn, flying to Clarks Point, singing songs at the Senior center and Gamma's, campfire by Bristol Bay, dance lessons, a potluck sponsored by the Holy Rosary community, and an outdoor mass at Aleknagik Lake! Youth from Saint Benedict and SEAS in Anchorage arrive at the Dillingham airport. They walk the short distance to Holy Rosary Catholic Church. Ryan goes to work helping to load a rota tiller that will be used to re-do the public Library lawn. Jim, Steve, and Janice gave us an overview of the Flight Service Station (FSS). Here Jim describes how the FSS helps the Bush Pilots to be safer while entering the Dillingham airspace. After visiting the Flight Service Station, some of our youth stand beside our Cherokee Warrior II for a quick picture. Before painting a wall of the church, several young adults start scraping. Painting was the fun part, cleaning the brushes, well, that was not too fun! Bob McMorrow cooks up a storm for dinner. 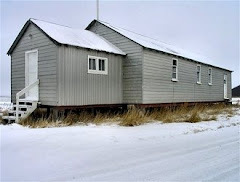 Here is a before shot at the Dillingham Library. Bob and I began digging up the weed infested lawn. Unfortunately, my rota-tiller broke down shortly after starting and Bob was left with the lion's share of the tilling. The youth come together to continue raking and packing off the large pieces of sod. David dumps his umpteenth load of old sod over the hill behind the dumpster. Carson takes a well deserved break from the action! Although these logs were cedar, they were in the ground so long they were rotting. 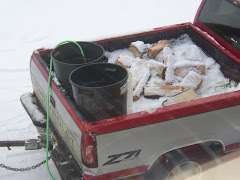 Kip, who works for the City of Dillingham could not believe that these water logged logs were lifted by our youth over to the Dumpster. Kip and his crew had to cut the log up into four pieces before they could dispose of it. The logs were used to separate the grass from the side-walk. Here is one of the smaller logs the youth eradicated. All the youth must work together to carry this huge log. Ashley takes a break to pose for a quick picture. During a rain squall, Briana gets a little wet but continues raking. Arthur Roraff, seminarian for the Archdiocese of Anchorage, checks the oil in our Cherokee Warrior II before I fly the adults over to Clarks Point. All of the youth flew with Mat of VanAir. Hi from Saint Peter the Fisherman in Clarks Point, Alaska. Mass usually begins at Saint Peter the Fisherman with Clark Point's favorite song, "Hail Holy Queen." During Mass Tom and John Thomas await communion. Cousins Chelsea and Julieana pose for a picture outside of Saint Peter the Fisherman in Clarks Point, Alaska. Judy George laughs with a friend after the 12:30 Mass at Clarks Point. I get my picture taken with Julieana and Emilia Taylor. This is a typical parking lot after mass in the great Alaskan Bush. Carson, Chase, David, and one of the Clarks Point villagers jump on a 4-wheeler. Buba Jumps while Chris Floresta spots him. During the shut down Clarks Point cannery tour, Mariano (Da Do) Floresta points out some of the village to the youth. There are actually robbers in Clarks Point, grab on to your wallets! James, Lauren, Maria, and Bertrand get some 4-wheeling in as well. Ryan climbs down the ladder. He actually looks afraid, no, couldn't be. Tony and Alec finally got a turn on the 4-wheeler and rode it around the cannery in Clarks Point. Six youth board Cherokee 61T to be flown back 12 miles across the bay to Dillingham. After flying six of the youth back to Dillingham, Mat returns in Cherokee 61T for the last six youth. Here they are all strapped in for take-off. Lauren played the piano and sang beautifully at the Senior Center. After several of the youth washed windows, Tony does some more community service at the Senior Center. Some of the youth gathered around and played cards. Here Ryan, Bertrand, Maria, and Lauren join in the game. Briana played a song on the piano while the youth mingled and talked with the Seniors. One of the seniors at the senior center actually got his picture taken with Joe Lewis. Here, Deacon Dez and Cindy duke it out in front of the picture. Yuri, Bertrand, and Father Scott talk before Mass. During Mass at the Senior Center, Lauren sings the Responsorial Psalm. Yuri is our lector at the Senior Center. Ashley, Cindy, and Briana pose with one of the Seniors at the Senior Center in Dillingham, Alaska. After visiting the Senior Center, the youth made the short walk across the street to Gramma's, an assisted living facility. Here, seniors at Gramma's in Dillingham watch as the youth from Anchorage sing and dance. The youth lined up and sang songs at Gramma's. 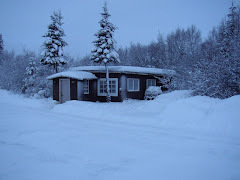 Gramma's is an assisted living facility in Dillingham, Alaska. Bertrand and Briana cut a rug at Gramma's. The 15 year old Bertrand from France awed the youth with his fantastic dance moves. After Gramma's, the youth took a tour through Peter Pan Fish Processing Plant. Here Maria and Lauren pose for a picture. Thursday evening the Holy Rosary community sponsored a potluck for the visiting youth group. During the Potluck, Angie Venua gets a few dance lessons from Bertrand. After the Potluck, the youth went to the harbor and had a campfire along the beach. Some of the local youth came by with left over fireworks and all had a great time. At the Campfire, Bob McMorrow looks enthused. Mass at Aleknagik Lake was windy and cold. Needless to say, we did not hang around for swimming and lunch. On the cold Friday morning, Alec reads the first reading during the outdoor Mass at Aleknagik Lake. With wind blowing, Maria reads the Responsorial Psalm during the outdoor Mass at Aleknagik Lake, which is 21 miles north of Dillingham. After the outdoor mass at the Lake, the youth play something called "Ninja." The game "Ninja" is in full swing Friday morning before the youth return to Anchorage on a 1:30 PM fight. Brian Venua, from Holy Rosary Parish in Dillingham, spent some quality time with the youth. Here he is playing the Ninja game with them. Noy, ticket agent for Penair, checks in Arthur, who will be traveling back to Anchorage with the youth. We will leave you with a picture of one of the youth at Clarks Point, Alaska running across the tundra (taken July 7, 2010). I think it is Christopher Floresta. 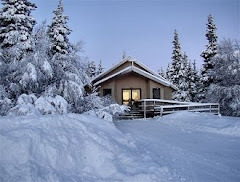 So long from the Great Alaskan Bush and see you all next year! Fly Safe Out There!